How To Make Lemon And Kale Chicken Tagine. Are you looking for some healthy recipes to try out? 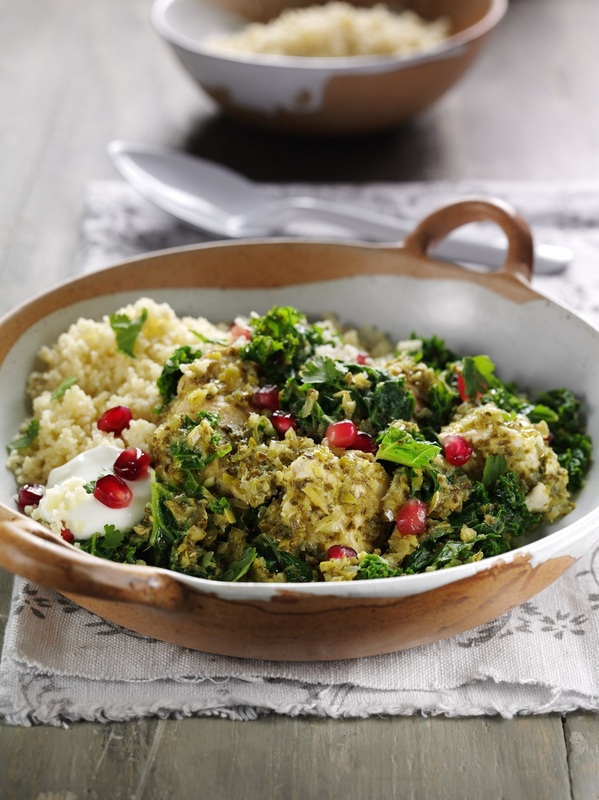 Today I have this lemon and kale chicken tagine dinner recipe to share. This recipe is packed full of healthy vitamins too from the leek and Kale. Energy – Leeks contain B vitamins which help the release of energy. Gut Health – Leeks contain a type of fibre called Frucooligosaccharides (FOS) which can encourage the growth of friendly bacteria in the gut. Bone Health – Leeks contain Vitamin K which is important for bone health. Nervous System – Vitamin B6 plays a role in the normal functioning of the nervous system. Immune System-Leeks contain B vitamins which help support the immune system. Place the lemons, coriander including the stalks, garlic, leek and 50g kale into a food processor with the stock and blitz to give a coarse paste. Heat the paste in a frying pan with the chicken for 5 minutes and transfer to a casserole dish, cover with a lid and cook for 20-25 minutes until the chicken is cooked through. Meanwhile, blanch the remaining kale in boiling water for 3 minutes and then stir into the chicken tagine. Place the couscous in a small bowl and pour over 200ml boiling water, cover with clingfilm and leave for 5 minutes, fluff up with a fork and serve with the tagine and a spoonful of fat free natural yogurt. Try using chicken thigh fillets instead of breasts and add some green olives. Quinoa ‘tabbouleh’ with British asparagus. How To Make A Tasty Prawn And Kale Paella. Asian Rice Noodle & Cavolo Nero Salad. Superberry Kale And Roasted Garlic Bruschetta. "Improving Or Moving your Home"
Oh that sounds super good!